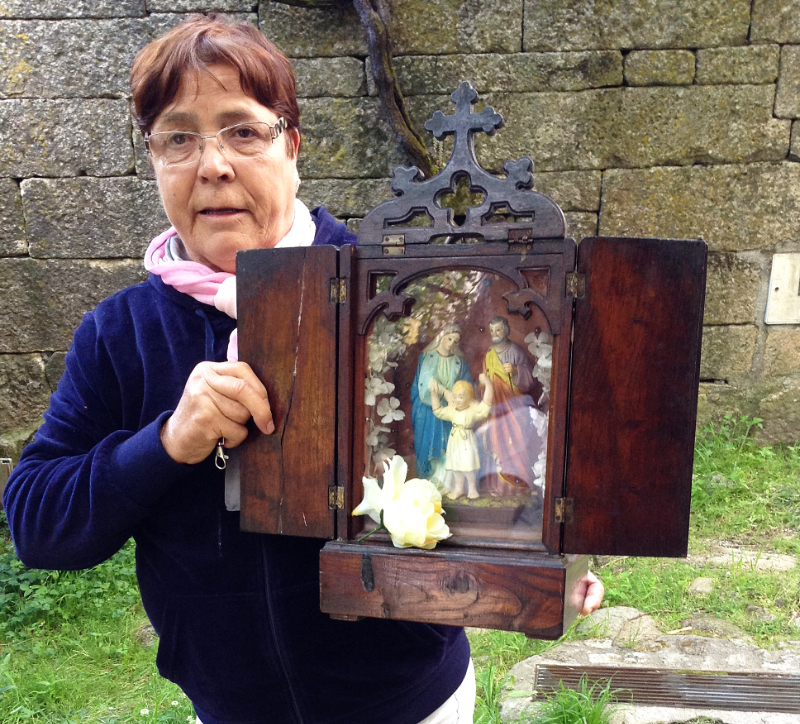 We were on the point to leaving Lindoso, when my friend Zé Manuel called me back to meet a lady with a wooden box. From a distance I thought it might house a musical instrument. "Nothing like that," he said, "Come and see." Why don't you come back with me now to that street in Lindoso and see what this lady was carrying and why? Click here to learn more. The lady opened the box to reveal a small, portable shrine. 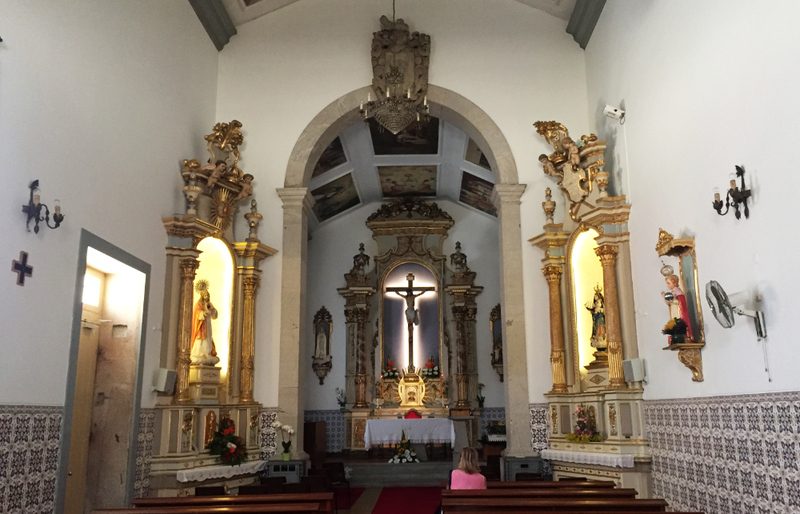 "We call this a 'Sagrada Familia," - a holy family – Zé said. "In villages we often have these little shrines and they're carried from house to house to bless them. They stay one night in each and then move on to the next house. Now Zé has lived in Lisbon for the last 50 years but he still remembers the local customs from his village upbringing in Beira Baixa, a province half way up Portugal, next to the Spanish border. I visited the village in the 1960s. It was extremely poor, with many folk on the breadline. Indeed, a number of families had left, making the 'salto' – the jump – over Spain to a better life in France or Germany. (Many more have gone since.) At Easter Padre Lobo, the village priest, used to tour the village, stopping to bless the houses and taking a glass of wine in each. By the time he reached the house I was staying in, it was late afternoon. We all went into the little parlour that was almost never used. We sat, in a square, on chairs placed around the edges of the room as though in a doctor's surgery, Padre Lobo taking the place of honour. He was definitely quite a bit the worse for wear, red faced, slurring his words and looking goofy. "It's enough to put you off religion for life!" said my father who was staying there too. (My father was a protestant, somewhat puritanical, church-going man and he was shocked.) Mind you, I don't suppose blessings are necessarily dependant on sobriety! Of course, life can be pretty grim in the Portuguese countryside today and blessings may still be needed to make it bearable but they don't have to involve a latter day Padre Lobo. This is just as well as the lady in the picture told us that nowadays priests are severely overworked because there are so few of them compared with the past. "They have to serve several communities," she said, "and everyone wants mass in their own church, obliging the fathers to rush from one village to the next." So in case people are missing out on their spiritual support, she is carrying on the old tradition. 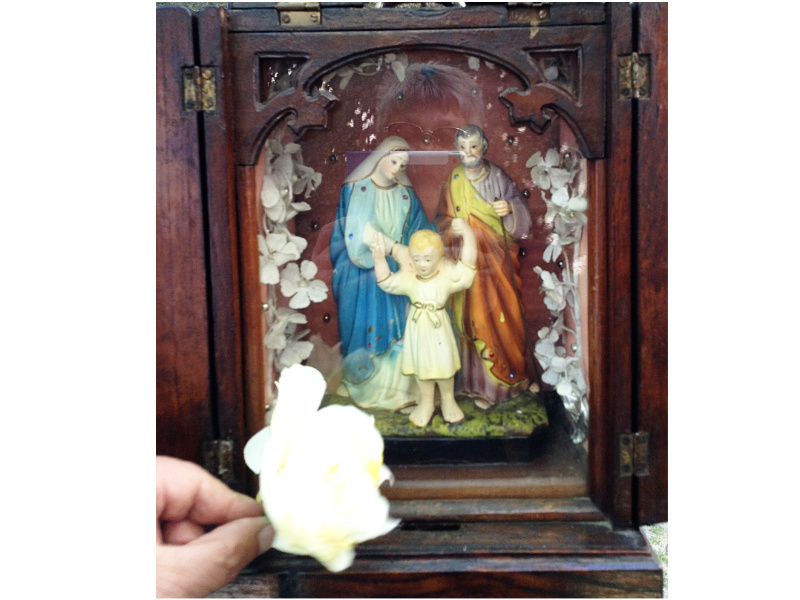 She takes the village's portable shrine with statues of Mary, Joseph and the child Jesus – the holy family – from house to house. Inside the box, when she opened it, there was also a white rose offering. We asked how many people there were in the village. That's not many considering the number of houses, though no home is abandoned completely and some have been attractively renovated with remittances from overseas. 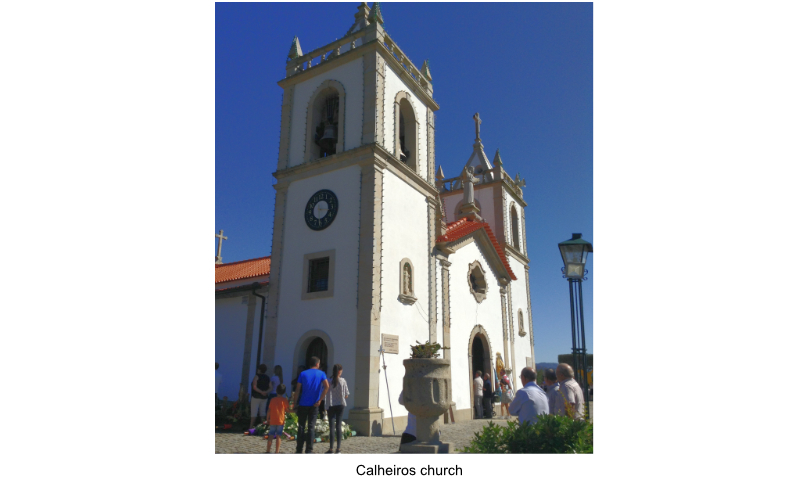 Many indeed are occupied in summer by families returning from France and Germany, from the big cities of Lisbon and Porto, and even from local large towns such as Guimarães and Braga: places whose names you probably know because of their football teams. "Now there are so few households," she said, "I don't need to move the Sagrada Familia daily. It probably stays with each family for about ten days." We walked back through the village towards the castle and the espigueiros, which I wrote about in Lindoso and an entrepreneur of yesteryear: http://www.me-n-youinportugal.com/index.php?p=1_5&nid=45. As we passed by, we noticed that the church was open so we popped in to have a look. Considering the exodus of people, we thought it might be rather run down. Far from it. The congregation may be small but it still honours its church. It was well maintained, clean and freshly painted. A group of ladies was busy decorating the altars with yellow lilies ready for mass the following day, which was Sunday. "I expect they're fake," Zé said of the lilies as he walked over to one of the ladies. "No, no, they're real," she replied, "Here, have one." "Aren't I lucky?" Zé murmured as we left. "It's a long time since a lady thought of giving me fresh flowers." Perhaps showing me the "Sagrada Familia" had brought him a blessing!